Beijing is winning its ‘war on pollution’ — slowly. According to the latest edition of Greenpeace East Asia’s city air quality rankings, the notorious China smog was 10% less intense in 2015 than it was the year before. That said, 80% of the 366 cities monitored are still in violation of the national pollution standard (35µg/m3), which is itself more lax than the World Health Organisation’s recommendation (25µg/m3). The average concentration of the toxic PM2.5 particulate stood at 50.2µg/m3 in 2015. It was a year of unprecedented highs, such as the World War II memorial in August which saw the country’s capital record its cleanest air ever, and dispiriting lows, including the first official ‘red alert’ events. And with the announcement of the ruling party’s 13th Five Year Plan due imminently, it’ll be interesting to see how prominently the country’s pollution problem features. The big picture is promising, with 171 cities (more than 90% of those also covered by the rankings in 2014) seeing a reduction in PM2.5. Among those markedly less polluted places is Beijing, which underwent a 3.3% improvement last year to reach 80.4µg/m3 — though it is still the country’s 27th smoggiest city. The Beijing-Tianjin-Hebei region has gotten a lot better, with PM2.5 concentration falling by more than 25% over the past two years to 77.1µg/m3 — and it’s on track to meet its 2017 target of 73. While major cities Guangzhou and Shenzhen also cleaned up their air, the pollution in Shanghai – which has always been the cleaner of China’s global cities – actually got worse in 2015 — its PM2.5 level rose 3.14% to 53.9µg/m3 (it’s ranked #144). In case you were wondering the smog ranking’s top five cities (or bottom, depending on how you look at it), here they are: Kashgar (119µg/m3), Baoding (107), Dezhou (102), Xingtai (101) and Hengshui (99). The year ended on something of a sour note where air pollution is concerned, with winter 2015 the most polluted period since the airpocalypse of 2012. 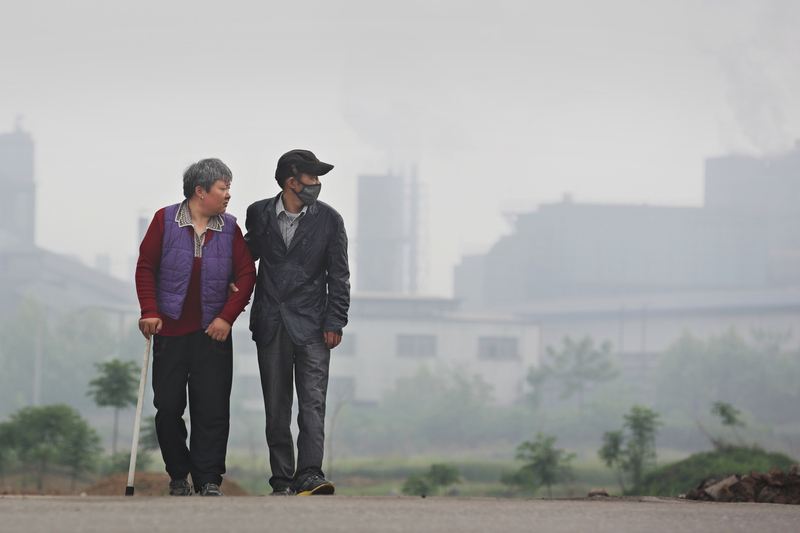 Baoding in Hebei province had 35 days of heavy pollution, while Beijing had 26. Greenpeace researchers reckon the severity of the smog was down to wind and humidity conditions, but the base cause remains all the cars and the coal. Something interesting happened in these particularly polluted winter months: the government began to issue ‘red alert’ warnings — in which people are advised to stay indoors, limits on car use are imposed and some factories are ordered to stop running. The ‘red alert’ had never been declared before it was for Beijing on December 8. It lasted three days. It was issued again two weeks later in 40 cities in country’s north (including Beijing) and lasted even longer. Looking at the graph above you might think the alert is fairly arbitrary, with more severe smog episodes before and after undeserving of the emergency treatment. But that first ‘red alert’ came about in part because of the outcry over the crisis-level pollution on December 1. The Chinese press has reported that environmental officials were reprimanded by government ministers and were thus more inclined to react to the next PM2.5 surge. The other factor in both red spots up above is that these were periods of prolonged pollution rather than peaks that quickly returned to business-as-usual. So there you have it: The newest weapon in Beijing’s ‘war on pollution’ arsenal.